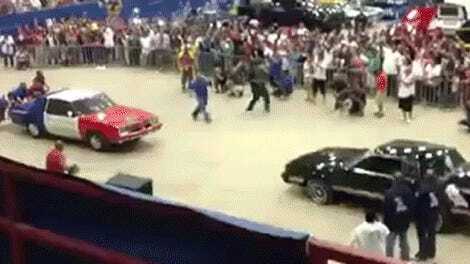 If you want to see the closest thing to a Transformer in real-life, look no further than the lowrider scene. Some of these insane builds will bounce so high onto their back wheels that they look like a weenie dog begging for treats. The New York Times traveled all the way to Odessa, Tex., a town more known for its appearance in Friday Night Lights (and not much else) than hydraulics. Yet at the Tejano Super Car Show, that’s what’s on display. The meet brings out custom cars ranging from the high-flying, battery-filled cars of the bounce competition to low cruisers on airbags and even one dad’s ultra-custom pedal car he built for his kid. Even pickups hop into the sky here, because welcome to Texas, that’s why. It’s all too easy to divide the car community among different concerns and tastes, but as someone whose mostly has cars to go fast, I still love these builds. Maybe it’s a more general fascination with the mechanical—the same reason a bunch of car dudes geek out to watches and cameras. I like to see what makes them bounce, the work that went into the paint, and everything. Or maybe it’s because lowriders are just plain cool. Whisk yourself away to a classic Snoop Dogg video, right here in Odessa.